Cannabis can negatively affect brain development when used by youth under age 25. Come hear from experts in health, enforcement, education, and a youth voice to learn how each frontier is being impacted. 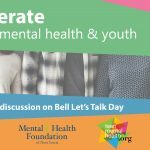 The panel discussion will be presented by TeenMentalHealth.org and the Mental Health Foundation of Nova Scotia at The Westin Nova Scotian. Ticket price includes parking, breakfast, tea, and coffee. For more information, visit https://www.facebook.com/events/376069389863390/.